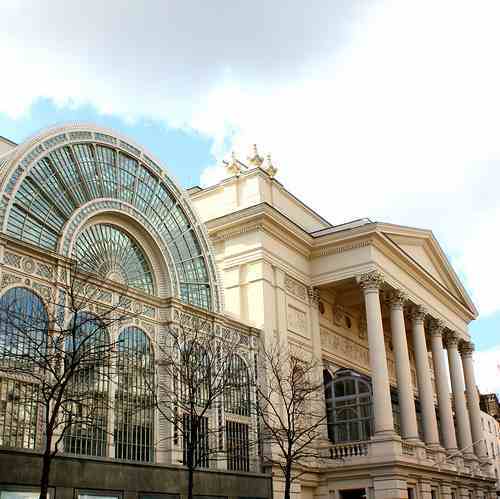 I thought I had found a STEAL on tickets to the ballet at the Royal Opera House. 4 GBP a ticket. Yeah, I know, I was just as surprised as you are. 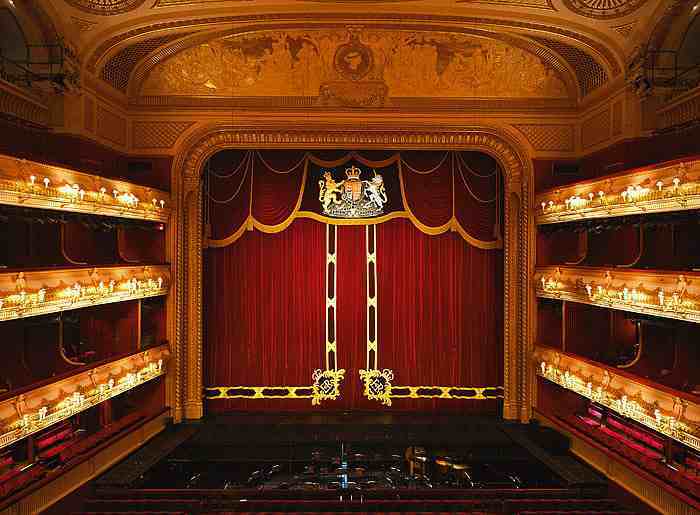 The Royal Opera House is beautiful. It sits right on the edge of Covent Garden, and it’s as regal and just as expensive-feeling as it sounds. You can always tell how big a deal a place is by its carpet, and the carpet at the ROH is borderline mattress material. It’s plush, to say the least. Anyway it turns out the tickets were so cheap because they were STANDING tickets. So I STOOD for an entire ballet, like a pauper. Bad day to wear high heels. The ballet itself was magnificent. We saw Raven Girl, accompanied by the Philharmonic orchestra of London or something like that. It took me a while to get into it, because the opening movement, featuring a Postman, was a little confusing. He wasn’t actually dancing, so I was a little bit annoyed. Also he was sans tights, which I thought was a ballet staple. Anyway he starts sorting out mail, then he hops on a bicycle and rides around for a while, and its not until he meets a bird that the actual dancing begins- because he falls in love with the bird. Like an actual bird. At first the bird is played by a child. I was alarmed because initially I thought “Holy hell, this is what it’s come to: Natalie Portman has put an abundance of pressure on ballerinas to look as close to a 9 yr old as possible.” Then I realized, with a quick ballerina replacement, that the postman waits for the bird to become an adult bird before he has his way with her. That sounded cheap. It’s important to note that the postman and the bird are in love. Some kind of biology is involved and suddenly postman and bird are eagerly awaiting a big egg to hatch, and I can tell from the super modern technology projections that inside the egg is something a little bit sci-fi. Well, the egg opens and out dances a human girl. Who is NOT replaced with an older ballerina at any point in the play. Anyway she dances around, learning all human things, etcetera etcetera, but fast feels like she doesn’t quite fit in with human life. 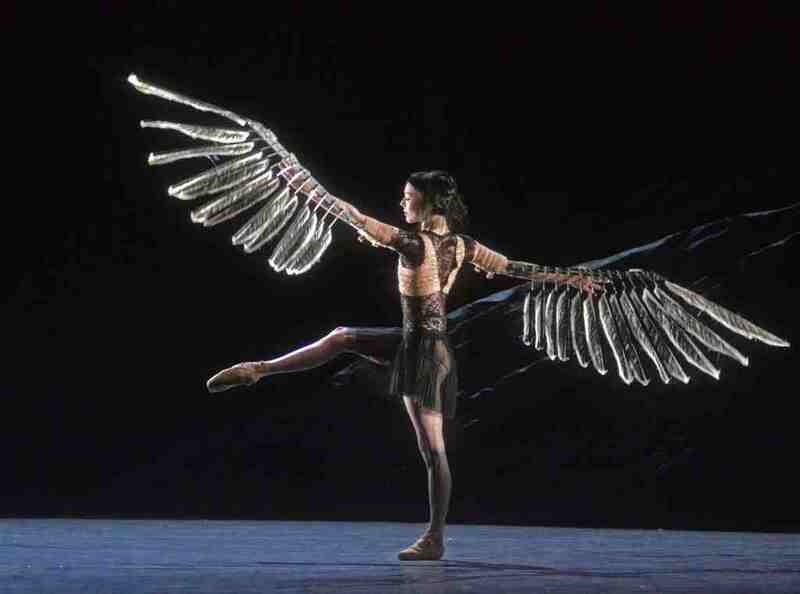 Oh, humans are portrayed as blundering baffoons in this ballet too. They are dressed in costumes that mildly reminded me of KKK robes and they shuffle gracelessly across the stage. It was the stuff nightmares are made of actually. Well cut to the contrast of the graceful raven birds who periodically flit about the stage. Then we’re in a classroom, where a scientist professor of some sorts who also is not dancing (scientists have no time for such tomfoolery) is lecturing on bird-people and wings in particular. I know he is lecturing because he does a lot of pointing and nodding. Raven girl sits in the front row and takes notes, then after class she stays behind to chat. Swot. Finally Teach starts to dance. I don’t consider it real dance until I see tights though, and this guy had a lab coat on and everything so lets just say he prances around while raven girl does the majority of the real dancing. Teach lifts her up and down and throws her around and it actually looks quite good and makes me think maybe she is trying to seduce him so that he will help her find her wings. Or they could just be friends. Like I said I can’t be sure until I see tights. Meanwhile there is a boy from her town who I think has a little crush on her because he folds paper airplanes all the time and follows her around. Again, no tights, so we’ll never know. Cut to a creepy operating hospital gurney where Teach is sedating Raven girl and he actually does some pretty good prancing. Then all of a sudden she has Edward scissorhands-style wings and town boyfriend tells on her to her parents, postman and bird. Daddy-postman is not well pleased and one thing leads to another, and Teach ends up falling out of a window to his death. Raven girl is really broken up over it, which makes me want to believe she did have a thing for him, and I guess boyfriend is a little bit guilty for his part in things so naturally he climbs up a Cliffside and hides in a hole. That’s the last we see of him. The next scene is Raven girl, sans creepy wings, dancing with a raven prince- complete with TIGHTS, so you know it’s legit ballet now. The dance a seriously beautiful dance, lifts and twirls galore, they kiss a bit and prance into the sunset together. So it’s a happy ending for them. Jury’s still out on boyfriend. Postman and bird are nowhere to be seen again. The ending with the applause and stuff is what got me. Guess how many encore’s? FOUR. It was good, but I don’t know that it was that good. I sort of had no choice about giving them a standing ovation seeing as how that was my natural state for the duration of the performance anyway, but four encore’s? I don’t know that I would willingly give ANYTHING four encore’s.